The sister of a recent Northern California homicide victim accused of robbing or attempting to rob eight banks — including ones in Arcadia, Temple City and Baldwin Park — was in federal custody Thursday awaiting trial, officials said. Obiomachuckuka Njokanma, 36, of Michigan, was indicted Tuesday on eight counts of bank robbery in connection with the alleged spree, which took place between Dec. 28 and Jan. 12, according to FBI officials and court documents. Officials said Njokanma also admitted being responsible for a Dec. 27 Modesto bank robbery for which she has not yet been charged. Her alleged San Gabriel Valley crimes include a Jan. 4 robbery at the Foothill Federal Credit Union, 30 S. First Ave. in Arcadia; a failed Jan. 10 robbery at a Wells Fargo, 11460 Merced Ave. in Baldwin Park; and a Jan. 10 robbery at a Bank of the West, 9934 E. Las Tunas Drive in Temple City. She was arrested Jan. 14 by by Los Angeles police, FBI spokeswoman Laura Eimiller said. A search of public records shows that Njokanma is a relative of Eldoris Graham, 28, of Modesto, who was found slain in her hometown Jan. 11. Graham’s boyfriend, 36-year-old Anthony Coxum, was not cooperating with investigators and gave inconsistent statements to detectives, but was not initially arrested in connection with the killing, Modesto police officials said in a written statement. Coxum was being held on suspicion of unrelated probation violations in Fayetteville, North Carolina, as the investigation continued, Modesto police added. He was driving Graham’s car when arrested. Graham was reported missing by her mother on Dec. 15, and her body was found Jan. 11, officials said. FBI investigators had been referring to the serial robber as the “60 Second Bandit” due to statements she made during the robberies indicating she wanted to get the money and be gone within 60 seconds, Eimiller said. But officials had not yet gone public with the moniker. During the robberies, Njokanma handed tellers notes threatening to shoot them or others in the bank if they didn’t quickly hand over large-denomination bills, according to court documents. She would often wear a baseball cap or a wig. 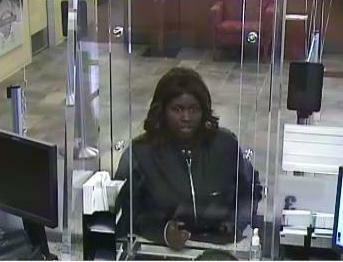 In all, the eight robberies Njokanma is charged with allegedly netted her $20,001. In addition to the three San Gabriel Valley crimes, robberies linked to Njokanma also include a Dec. 28 robbery at the American Federation of Television and Radio Artists-Screen Actors Guild Credit Union in Burbank; a Dec. 31 heist at a U.S. Bank in Bell; a failed Jan. 8 robbery at a Wells Fargo branch at 3800 Wilshire Blvd. in Los Angeles; a Jan. 9 robbery at the First Financial Credit Union, 5115 Wilshire Ave. in Los Angeles; and a Jan. 12 robbery at a Citibank, 270 N. Vermont Ave. in Los Angeles. 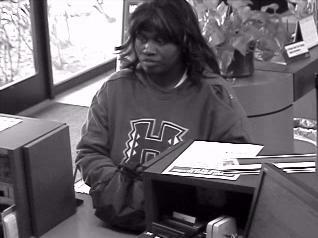 BANK SURVEILLANCE PHOTOS of Baldwin Park attempted robbery (above) and Temple City robbery (below) courtesy of the FBI. This entry was posted in 211, Arcadia, Baldwin Park, Banks, Temple City by Brian Day. Bookmark the permalink.